2013 Jinan Morn mdl. MT-L960 Laser Engraving and Cutting Machine s/n 2013051 w/ CO2 Laser, 23 3/4 x 35 1/2&quot; Table, mdl. CW-3000 Chiller, Blower. 1993 Litton mdl. EE125 Glass Lathe s/n 360R w/ Variable Speed Drive, Torch Heads and Misc Tooling. Heathway 16” x 24” Glass Lathe w/ Variable Speed Drive, Torches and Acces. Litton mdl. F-U 8” x 16” Glass Lathe s/n 1007 w/ Variable Speed Drive, Torches and Misc Tooling. 2000 Litton mdl. F053 8” x 12” Glass Lathe s/n 1543R w/ Variable Speed Drive, 5C Colleted Heads, Torches and Acces. 2-Station Glass Tube Pinch Press w/ Rotary Die Heads, Torches and Acces. 12-Station Blass Tube Drop Sealer w/ Torch Heads. Du-Gil Glass Tube Drop Sealer w/ Vacuum Pump, Gages and Torch Tips. Litton mdl. VS-D Glass Tube Drop Sealer w/ Torch Heads and Regulators. Wale Heathway mdl. “16” TILT Head” Glass Cutting Machine w/ Diamond Blade, Coolant. Glass Lathe Torch Heads and Acces. G-Tec mdl. TB125 Natural Gas Torch Booster. GT-Pak mdl. DM-200 Natural Gas Compressor. GT-Pak mmdl. TB-90 Natural Gas Torch Booster. Neutec & Studio Plus 100&quot; Microscopic Laser Welding System s/n SP10067 w/ Nd-YAG Laser Crystal, Maximum Pulse Power 20mS @ 100 joules. Miller 330 A/BP Constant Current AC/DC Arc Welding Power Source. Chicago Electric 165A TIG Inverter Welder. Unitek mdl. 1-180- 02 250 Watt Seconds Micro Spot Welder. Vacuum Chamber w/ 50” Dia. x 36” Stainless Steel Chamber, Pneumatic Actuated Chamber. Centrotherm “Guidant VI” Sintering Furnace s/n 0001 w/ Computer Controls. (2)Lindberg Type 51668-R 1200 Deg C Environmental Furnaces w/ Roll-In Environmental Chambers. Lindgerg mdl. 51442 1200 Deg C Environmental Furnace w/ Stainless Environmental Chamber, Computer Monitoring System. Denton DV-502 Vacuum Deposition System. Lindberg Type 54352 1200 Deg C Benchtop Laboratory Tube Furnace w/ Type 59544 Control System. Lindberg Benchtop Laboratory Tube Furnace. Sam-Han Vacuum Development “Strip Caster” mdl. SVR-201 Vacuum Induction Furnace w/ HF Power Supply, Korea Diavac Vacuum Pump. BlueM mdl. BF51728C1100 Deg C Furnace. Turbotronik NT151/361 Turbo Pump system w/ Alcatel Vacuum Pump, Kurt Lesker IG2200 Ion Gage Controller, 10-Station Multiport Manifold. Turbotronik NT150/360 Turbo Pump system w/ Vacuum Pump, Kurt Lesker IG2200 Ion Gage Controller,10 Station Multiport Manifold. Lepel mdl. T-5- 3-MC- BW 12.7 kVA Induction Heating System w/ Stand. 2012 Across International mdl. IH15AB 7kW Induction Heater System w/ Digital Controls, Cooling System and Cart. Cycle-Dyne mdl. B-50 5kW Induction Heating System. VWR mdl. 450M and Napco mdl. 58301 Thermal Vacuum Chambers w/ Alcatel Vacuum Pump and Stands. GoodKiln / SlipMaster 5600 Watt Electric Kiln. Cross mdl. Fuser 89E Electric Kiln. 300 Below Inc. &quot;Cryogenic Tempering -300 Deg F Cryo-Processor&quot; w/ Computer Monitoring System. Legacy mdl. PAC60s2-T3- Z Chiller System w/ Pumps, Storage Containers and Rack. MicroVu mdl. 500HP 12&quot; Table Model Optical Comparator. LRI Lighting Resources International Type S105 Test Station w/ PLC Controls. Leybold-Haraeus Test Apparatus w/ Stand. Clearaudio &quot;Maximum Solution&quot; Turntable w/ Master TQI Tangent Tone Arm (NO STYLUS). Graff GM20 OTL, PrimaLuna ProLogue One and THD PicoValve Amplifiers. ART &quot;Tube MP Studio&quot; Tube Microphone Preamplifier. AMC mdl. MD5401 Bitstream DAC and Misc Guitar Effects. Fender &quot;Pro-Junior&quot; Amplifier and Champ Guitar Amplifier. Jolida mdl. JD 301RC Integrated Amplifier and Speakers. D &amp; A Speaker System and Opera Platea Speaker System w/ Cords. Concord mdl. 1550 15” x 50” Geared Head Gap Bed Lathe s/n 0175 w/ 25-2000 RPM, Inch/mm Threading, Tailstock, Steady Rest, 8” 6-Jaw Chuck, 12” 4-Jaw Chuck, Coolant. (4) RCA mdl. 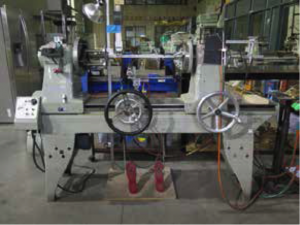 705Y Universal Grid Winding Machines w/ Acces. Jet mdl. JMD-18 Mill-Drill Machine w/ Ditron D60-2M Programmable DRO. Central Machinery 6” Metal Cutting Band Saw w/ Coolant. Import mdl. G5012W 5” Horizontal Band Saw w/ Coolant. (2) Diebold Stamping Presses (FOR PARTS). Durant Motorized Coiler and Feed Unit. Kaeser SM8 7.5Hp Rotary Air Compressor s/n 08554 w/ 30 CFM @ 110 PSIG, 6088 Hours, Kaeser TB26 Refrigerated Air Dryer, Air Tank. 2013 Kaeser Air-Center SX-5 5Hp Rotary Air Compressor/Dryer/Tank Combo s/n 1319 w/ 21 CFM @ 125 PSIG. Nachi 6-Axis Robotic Manipulator (NO CONTROLS). Delta Shopmaster 12” Vertical Band Saw. Proxxon 5” Vertical Band Saw. Chicago 14” Abrasive Cutoff Saw. Shop Fox mdl. M1052 12” 3-IN- 1 12” Shear – Brake – Roll w/ Table. Central Pneumatics Dry Blast Cabinet. (3) Kendal mdl. HB-S- 027HDT Ultrasonic Cleaning Tank w/ Digital Controls. Pittsburgh 20 Ton Air-Over- Hydraulic H-Frame Press. Coherent 7200 Series Cavity Damper and Coherent 5920 Dye Circulators. Brooklyn &quot;The Replicator Maker BOT&quot; mdl. 12224 3-D Printer w/ 5&quot; x 7 1/2&quot; Table (NO COMPUTER). Pallet Racks w/ Nippon-Muki Filtration Systems. Table Top Spray Painting Booths. Stainless Steel and Maple Top Work Benches. Yale and Hand Master Pallet Jacks. Tegal &quot;PLASMOD&quot; Vacuum Plasma Etching System w/ Trivac Vacuum Pump, Power Bright VC-3000W Step Up and Down Transformer, Oxygen Tank and Acces. Tektronix TDS1002 2-Channel Digital Oscilloscope, Atten ATF20B DDS Function Wave Form Generator. GW Instek mdl. GOS-620 Oscilloscope. Amber mdl. 5500 Programmable Distortion and Noise Measurement System. Hewlett Packard 3582A Spectrum Analyzer. Rion mdl. &quot;Status 2100&quot; Particle Counter. BK Precision mdl. 878A LCR Meter, Velleman HPS10 Personal Scope, Elenco Transistor-Diode Tester. HP 6207B Power Supply, Ionivac IM 110D Ion Gage Controller and Milliamp Meter. Tube Tester and Capacitor – Resistor Analyzer. Dressen-Barns mdl. 5-300F Regulated Power Supply and Table. Weston mdl. 686 Vacuum Tube Tester. Tektronix Type 576 Curve Tracer. BK Precision mdl. 1786A Programmable Power Supply and Mastech HY3005F-3 DC Power Supply. Snell &amp; Wilcox TBS185 Synchronizer and Comdel RF Power Supply Fluke Multimeters. Electronic Components, Test Leads and Hardware.